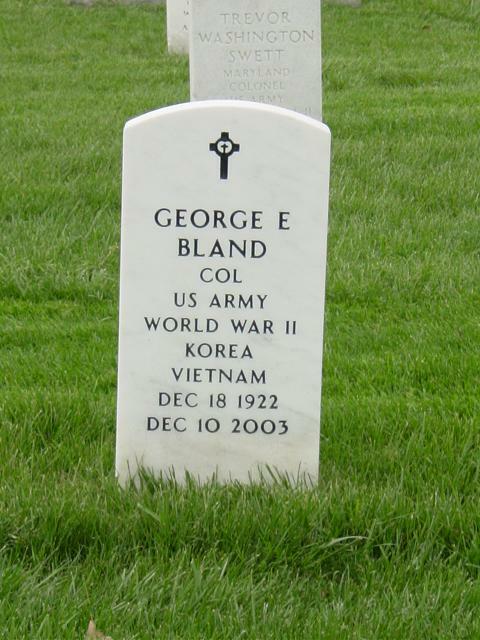 George Earl Bland, age 80, Colonel, United States Army (retired) of Richmond, Virginia, died on December 10, 2003. He was a highly decorated infantry commander with over thirty decorations and awards, including the Distinguished Service Medal, two Silver Stars, two Distinguished Flying Crosses, and the Purple Heart. He was preceded in death by his wife Hazel, and is survived by his wife, Marilyn; daughters, Patricia Tagert, Barbara Kerhin and stepdaughter, Cammie Walker; sons-in-law, James Tagert and William Walker; stepson, Timothy Jay Crider; grandchildren, Jamie, Jimmy, and Joey Tagert, stepgrandchildren, Kristen and Josh Walker. Colonel Bland was born December 18, 1922, in Lafayette, Indiana. He was first commissioned in 1943 following graduation from Indiana University, and served in the South Pacific before receiving an appointment to West Point. Following graduation from West Point in 1947, he spent three and a half years in Germany where he commanded a rifle company in the 26th Infantry Regiment. Other assignments included the Infantry Officers Candidate School, the University of Detroit R.O.T.C., and the Office of the Army Deputy Chief of Staff for Intelligence. During the latter assignment, he earned a master's degree in International relations from American University. Following graduation from the Army Command and General Staff College and theArmy Language School, he was the advisor to the select Palace Guard in Saudi Arabia. Upon his return to the United States, he was the Deputy Chief of Staff for Intelligence of the 82nd Airborne Division and then served in the Office of the Army Deputy Chief of Staff for Operations. Colonel Bland served two tours of duty in Vietnam. In his first tour as an infantry battalion commander, he earned his first Silver Star, his second Legion of Merit, Air Medal with Valor, and seven Air Medals. During his second tour, he was assigned as M-16 Advisor and then as Brigade Commander, Mobile Riverene Force, with the 9th Infantry Division in the Mekong Delta. He was wounded in 1969 when he ordered his helicopter to land to pick up a badly wounded soldier. During this tour of duty, he earned his second Silver Star, two Distinguished Flying Crosses, his third Legion of Merit, the Soldiers Medal, Bronze Star Medal with Valor, the Purple Heart, fourteen Air Medals, and his second Commendation Medal. After convalescent leave, he was selected to attend the British Imperial War College in London and the Harvard Advanced Management Program. His last military assignment was asExecutive Officer to the Deputy Under Secretary of the Army, where he served until his retirement in 1974. For his performance in this position and in recognition of his outstanding service to the country, he was awarded the Distinguished Service Medal, the Army-1/8s highest award for non-combat service and third only to the Congressional Medal of Honor and the Distinguished Cross. Following five years of service with the Amtrak Northeast Corridor, Colonel Bland moved to Richmond where he was employed as Vice President for Operations with Brandermill Woods, and subsequently to Pinehurst, North Carolina, where he was the Executive Director for the Quail Haven retirement community. For several years, he and his wife Marilyn enjoyed a second retirement at their home on the 15th hole of Course 3 in Pinehurst until their return to Richmond in 1993. Funeral services will be held at 11 a.m., January 28, 2004 in the Old Post Chapel, Ft. Myer, Virginia followed, by burial with full military honors at Arlington National Cemetery.